It would be sad to lose a great view, can you think something up ? azriel wrote: It would be sad to lose a great view, can you think something up ? I'm going to have a large rectangular window in the rake wall (the end wall) at the back of the loft. You can see the rough opening of it in the wide-angle picture. But, to keep some of that nice view out the front of the house, I think I'm going to add a dormer window -- you know, one of these puppies* -- to the front of the cabin. That gives me more room in the attic, more light, and more view. Nice to see how things are progressing. I gather the last photo is not actually your cabin???? 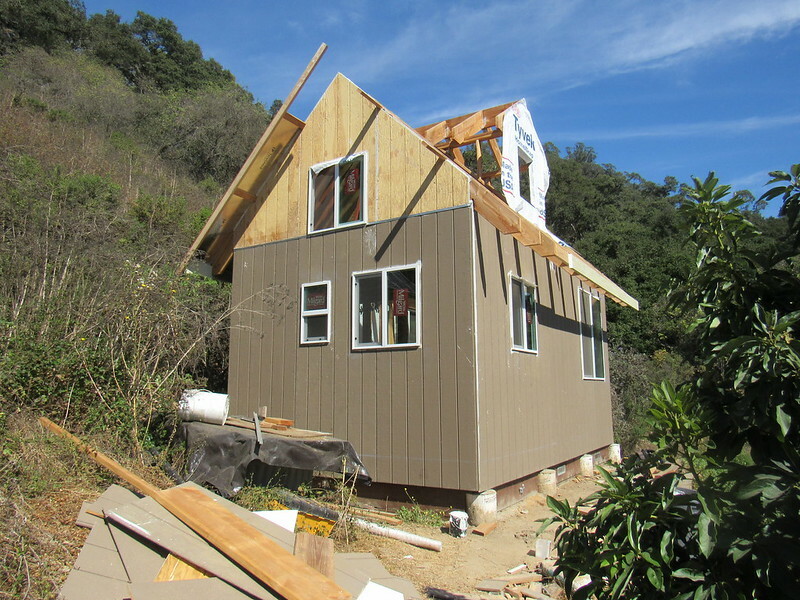 Wait, you'll add a dormer in the front where there's no loft? That's kind of different. Or is the loft on the side rather than the back? Or both? I'm so confused. Ok, I see in the wide view the loft is in back with the upper rectangular window. A dormer window away from the loft would mean you are looking up through the window, which may provide light but no view. Mebbe you want two - one in the loft for space and view, and one in front for extra light? Or maybe by front you mean the side facing downhill, 90 degrees from what looks to be the front entrance? Do you find my obvious interest in the proceedings to be cute, Az? What on earth is a Buckie Garden? 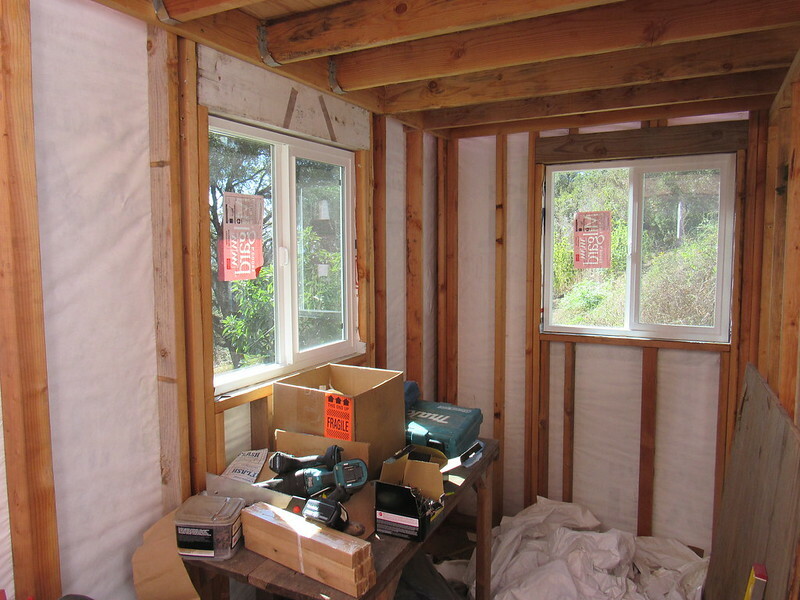 Oh lordy, what I meant was that there is currently space for a window in the wall on the end of the cabin where the loft is: you can see the framing for it in some of the pictures. 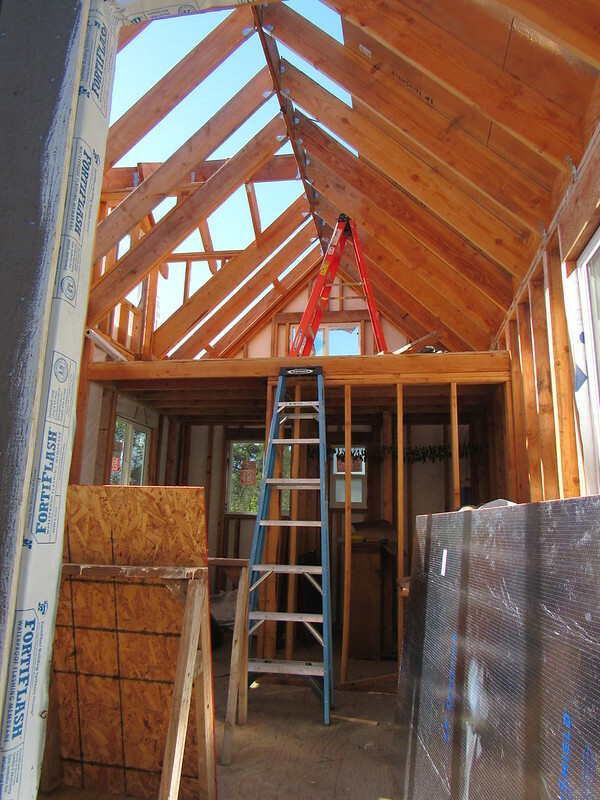 In addition, I'm going to add a Dormer in the roof on the downhill side of the house in such a way that if I stand in the loft I can look directly out the dormer window and the dormer will be adding to the head-room in the loft. Orwell wrote: Nice to see how things are progressing. I gather the last photo is not actually your cabin???? 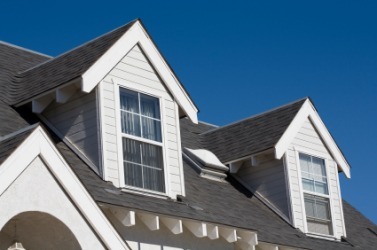 Oh goodness no, that's just a stock photo of some dormers. So you were referring to the downhill side as the front. Sensible, especially if you stick a porch on that side. I like it, I like it very much. It's been so long since I updated this thread! I guess it goes to show my lack of progress. You can see the dormer! 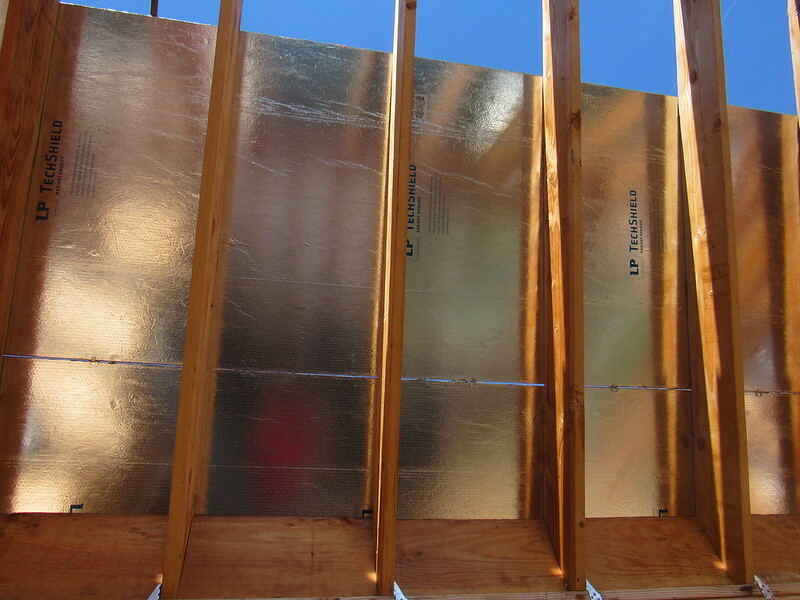 The plywood has a radiant barrier on the inside to help with insulation. 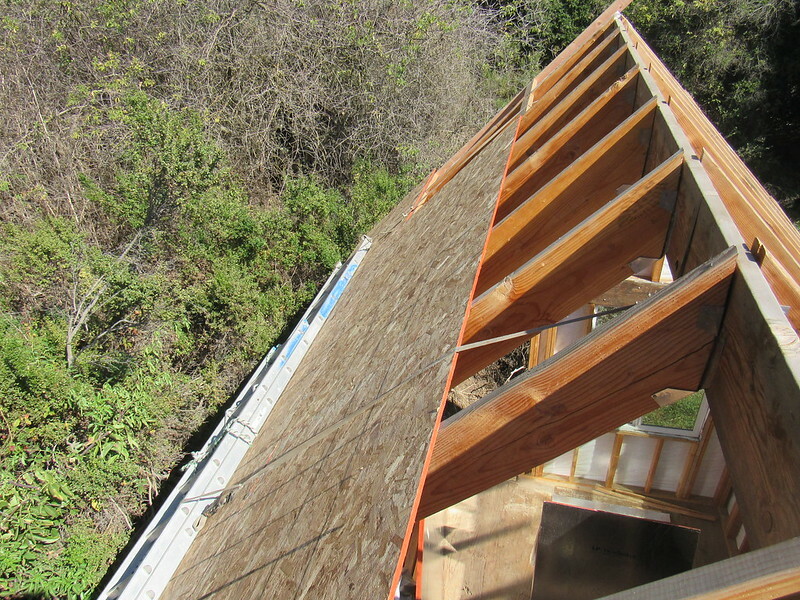 I'm not looking forward to the roofing because it's pretty steep. I have a safety harness that I can kind of hang from, so maybe I'll just try and work on it like that. Looking up through the front door. The bedroom is upstairs, the bathroom beneath and to the right, and the kitchen off to the left. 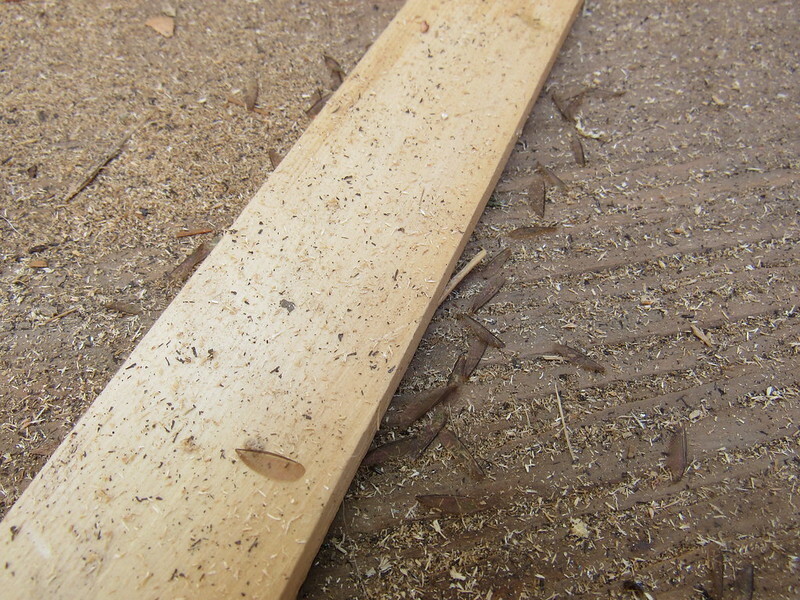 Apparently the house has been swarmed by dry-wood termites looking to start new colonies. I have a special hatred for termites, so I went and bought several gallons of a borate solution that, supposedly, makes wood inedible for termites and other pests as well as mildew. You paint or spray it onto interior wood and it then soaks in. I really hope it works, or at least that it makes me think it works so that I can just pretend that there aren't termites in the walls. You can see their stupid little discarded wings all over the place. Oh, and the siding came pre-painted that colour. I'm pretty sure I'm going to repaint it later. I've been wondering what was going on with that! Summer must have kept you pretty busy. Looking forward to the porch. Very cool to see your progress again, Forest! Good luck against the termites. Wow ! Its fantastic Forest !! My hat goes off to you ! It looks lovely ! Hope that goop puts those bugs off from eating your "home" ! I'm sure this particular cabin erection will have a happy ending. A memorable erection, huh? I don't think Forrest is that old. Maybe he's young enough? Now that is a massive erection! Looks pretty hard to get it up too! In all seriousness that's really impressive work, Forest. A good erection must be preceded by plenty of mental imagery....err...planning. That's the key.